Winter is just around the corner, so here is your official reminder from Simpson Plumbing to insulate your exposed pipes. If you’ve been putting off this crucial action because you aren’t sure how to do it, say goodbye to confusion. Get ready for Simpson’s just-for-you guide to insulating your pipes: simple steps that you can follow to prevent a winter plumbing catastrophe. 1. Clean em’ up! Exposed pipes can get filthy from the dust and debris present in crawl spaces and beneath flooring. This grime can prevent insulation from clinging appropriately to your pipes, allowing cold in. Remove dirt and grease from your pipes with a rag and gentle cleanser. Be sure to let them dry fully before insulating. Waiting for your pipes to dry is also a great time to check for leaks and be sure that no repairs are required. If you observe any issues, be sure to contact Simpson immediately to get the problem resolved. 2. Measure your pipes: Find out how much insulation you will need – and how wide it should be – by measuring the length and diameter of your pipes. 3. Choose your insulation: Foil and fiberglass insulation must be wrapped around the pipe with a ½” overlap in order to fully seal. However, both are effective in keeping your pipes from freezing. 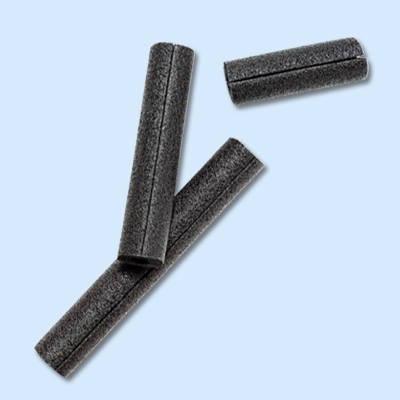 Foam, semi-split insulation is another great option. The slits down the side that allow it to fit over the top of your pipes for easy installation. 4. Insulating: Once you have chosen your insulation, use these steps to get those pipes wrapped. *Put on protective gear: Working in confined spaces requires safety head gear and gloves. Make sure your gloves are not too bulky, however, as you will need dexterity to complete the project. Goggles and a breathing mask are also excellent to keep on hand if the area is dusty or full of mildew. You will be using long strips mounted on a spool. Cut off a reasonable length and secure the start of the insulation to the pipe using duct or foil wrap tape. Wrap insulation around the pipe, maintaining a firm tension as you go. Maintain ½ inch of overlap as you wrap. At the end of the piece, secure the insulation using the same tape as above. When wrapping around bends, be sure that there are no gaps between pieces of insulation. Wrap bends in duct tape to be sure none comes loose. If using fiberglass, wrap the insulated pipe in plastic wrap to be sure no condensation moisture drips off the pipes. Cut the insulation to match the pipe length. Separate the split and fit the tube over your pipe. Secure the opening using duct tape. If you require more than one length, use duct tape to seal the joints. Finally, secure all insulation at 5 to 6 foot intervals with duct tape to be sure it stays on tight. Insulating your pipes will not only prevent frustrating freezing and breakages; its saves you money on heating and energy costs. With these simple steps, you will gain peace of mind as temperatures drop, so you can enjoy the fun stuff, like hot cocoa and roaring fires, without the plumbing drama. Looking for professional assistance? Our expert plumbers are happy to help you.